Well, I've been putting off this thing of setting up a blog. Today is the day. Monday, August 11, 2008, I launch myself and my dollmaking... out there. Why did I choose 'shredsandtatters' as my blog identity? I've given the choice of a blog identity a lot of thought over the last few months, and seriously considered a couple of choices. I'll tell you about my other identity possibilities some day, but the phrase 'shredsandtatters' pretty much describes my thought processes these days ... so much to do, so little time. I hope having a web presence through this blog and having to present a modicum of coherence (is that a word? ), will instill some order in an often scattered mind. I know everyone has more to do than the time to do it in, so I'm in good company there. On another level, the phrase 'shreds and tatters' refers to my style of dollmaking in that I often use torn fabric edges in the finished costumes of dolls I create. I enjoy the visual texture added by a fabric's ragged edges and the air those edges add of the doll somehow being not quite finished with more to come. I'm so pleased to tell you that I am one of the 7 new (2008) artist members of ODACA, Original Doll Artist Council of America. (You might like to read more about this journey on the blog of whimsymoondesigns, my good friend Angela's creation that is the inspiration and impetus for me to get blogging.) This application for artist membership in ODACA has been a 9-month journey of discovery, anticipation, jitters, with positive and negative emotions all along, periods of confidence broken often by periods of extreme lack of confidence. What a trip! This new membership is another reason I am taking the step of setting up my blog. As a new ODACA member, I will have a page on their website (http://www.odaca.org/) and really do want viewers of my work there to have a link to another spot on the web where more of my work can be seen. I'll stop for today, this is getting long and I sure don't want to bore you. Now it's time to figure out how to get some pictures up here. I figured it out and it was easy! 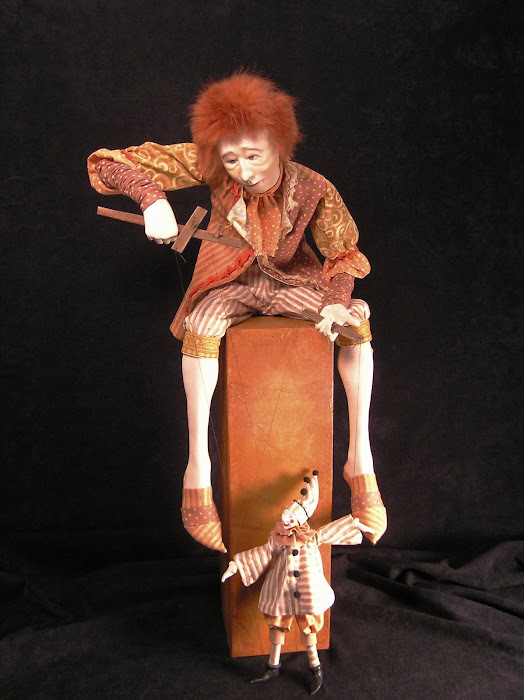 Marionette Master is pictured below. Nice to see you here! Congratulations on your acceptance!